As Coaches deploy Tests and Knowledge Checks within Huddles, the SalesHood’s Reports page can be used to track the test scores. To access the Test Results page on the SalesHood Reports page, click on Reports from the top menu on any page while in the SalesHood web app, then select the Test Results tab from the tab selections. By default, the Test Results report shows Tests that are part of active Huddles over the past six (6) months. Test Name – Sorting the list by the Test Name header will list all the items alphabetically by the name of the test module within the Huddle. # of Participants – Sorting the list by the # of Participants header will list all the items numerically by the number of individuals who have gone through the test module within the Huddle. Completion – Sorting the list by the Completion header will list all the items by the completion percentage for participants who have gone through the test module. Average Score – Sorting the list by the Average Score header will list all the items by the average of what participants have scored for that test module. Additionally, you will be able to search for any test by typing in the search box, which will predictively auto-populate the list. The number counter next to the search box and line item icon will show you how many tests are populating for your search, or, more specifically, how many items there are currently on the list. At any time, you can click the Reset Filters icon to clear your search to show all tests within the instance. Huddle – Sorting the list by the Huddle header will list all the items by the name of the test module within the Huddle. # of Tests – Sorting the list by the # of Tests header will list all the items by the number of test modules in each Huddle. # of Participants – Sorting the list by the # of Participants will list all the items by the number of users who have been assigned to or completed the Huddle (for the latter, this applies to open Huddles). Average Score – Sorting the list by the Average Score header will list all the items by the average participant score for that test module. Similar to the test search, you will be able to search for any Huddle by typing in the search box, which will predictively auto-populate the list. The number counter next to the search box and line item icon will show you how many Huddles are populating for your search, or, more specifically, how many items there are currently on the list. At any time, you can click the Reset Filters icon to clear your search back to show all Huddles with test modules from within the instance. Segments – Using the Segments drop-down will filter the report to show results sorted by users assigned to the specified Segment within SalesHood. 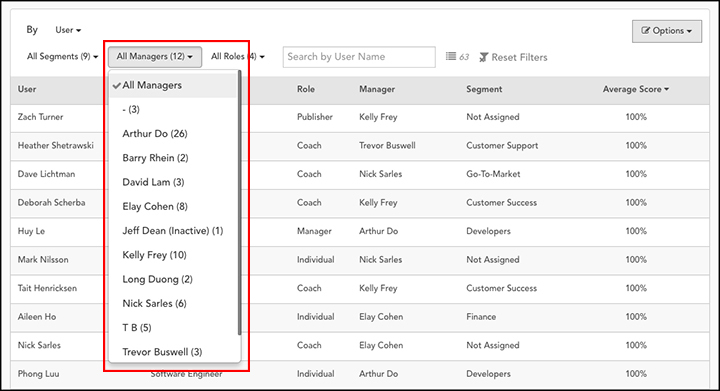 Managers – Using the Managers drop-down will filter the report to show results sorted by users assigned to the specified manager’s team. 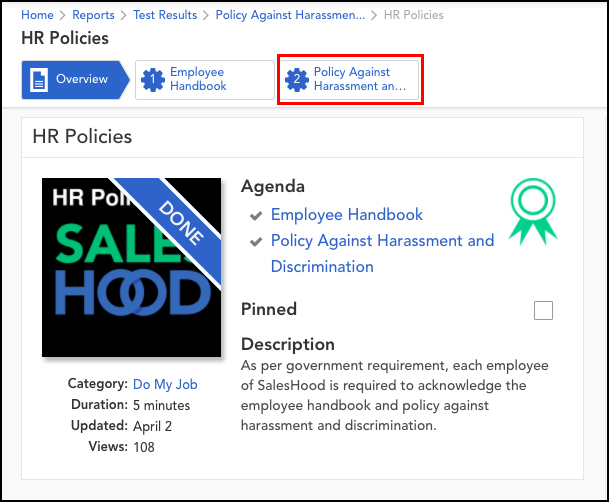 Roles – Using the Roles drop-down will filter the report to show results sorted by users by their assigned role in the SalesHood system. The four (4) roles in the SalesHood system are Individual, Manager, Publisher, Coach. You will be able to search for any user by typing in the search box, which will predictively auto-populate the list. The number counter next to the search box and line item icon will show you how many Huddles are populating for your search, or, more specifically, how many users there are currently on the list. At any time, you can click the Reset Filters icon to clear your search back to show all users from within the instance. Export to CSV – Clicking the Export to CSV button will download the report as it is currently sorted to a CSV file (comma-separated values), which can be imported into programs that store data in tables such as Microsoft Excel or Google Sheets. To do this, click the Options button at the top right of the report list, then choose Export to CSV.